Scott Johnson provokes a strength of feeling reserved for very few in Scottish rugby. 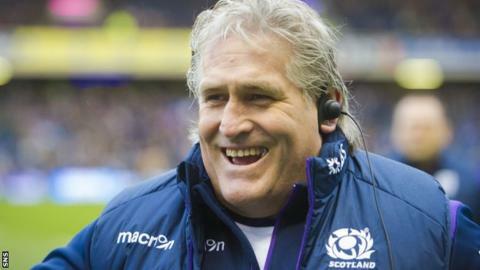 His critics say he is a failed coach who presided over some of the Scotland team's darkest days when in interim charge from 2013 to 2014 before becoming director of rugby. The same people will argue his impact following that promotion has been minimal, but those who work alongside him paint a different picture. "A grievous blow to the organisation," was how Scottish Rugby CEO Mark Dodson described Johnson's impending move to his native Australia in a similar capacity. "Love him or loathe him, he's done a fantastic job. I think people will realise what he did for the union, how good he was, when he's not here." Those the words of Edinburgh head coach Richard Cockerill, not a man famed for adopting the party line or allowing words to be put in his mouth. "Everyone wants to be liked but I'm not in the job just to be liked. I'm not a politician," Johnson told BBC Scotland in his final interview before returning to his homeland to link up with the Wallabies. "People that make these comments don't know me and that's fine, they're entitled to their opinions. The intention was to get it right and I think we did far more right than wrong." Johnson arrived in 2012 as assistant to then Scotland head coach Andy Robinson. Following the Englishman's departure, Johnson stepped in to take temporary charge whilst also, in the director of rugby role, leading the search to find his successor. It seemed a lot for one man to take on, and results seemed to bear that out. In his 16 Tests in charge, only five were won, three of which were against Italy. The nature of some of the defeats, most notably a record loss to Wales and a home beating by England in the 2014 Six Nations that had some even questioning whether Scotland should lose their place in the tournament, caused irreparable damage to Johnson's reputation in the eyes of many supporters. "It wasn't catastrophic. We finished third in the Six Nations, then fifth," says the Australian. "If you go back to the start, I was brought in to do a specific job with a clear mandate to get us competitive for the 2015 World Cup. "It was all about trying to set it up right. What's the old saying, 'Everyone wants to go to heaven but no one is prepared to die'. "I won't say we got them all right, but they were done with the best intentions." Johnson was instrumental in the capture of Vern Cotter as head coach and when the New Zealander arrived in the summer of 2014, he moved upstairs and largely out of the public eye. Since then, the national team have become a competitive force under Cotter and then Gregor Townsend. Infamously, a controversial penalty call against eventual finalists Australia denied them a place in the 2015 World Cup semi-finals. On the domestic front, Glasgow won the old Pro12 title in 2015 and, after years in the doldrums, Edinburgh have been reborn since Johnson helped to recruit firebrand Cockerill to lead the revolution. With both pro teams in the quarter-finals of the European Champions Cup this season for the first time, Sevens and age grade teams all showing encouraging signs of improvement and a general sense of momentum developing around Scottish rugby, Johnson feels he is leaving behind a game that is thriving. "Our improvement has been as great as anybody else's," said Johnson, who also had a spell working under Graham Henry and then Steve Hansen with Wales in the early 2000s. "My dad used to have a saying, 'If you want to be good at something, make it more important.' We've made rugby much more important. The growth in Scottish rugby in my time here, not attributable to me, has been immeasurable. "I genuinely think it's the one team sport, of the ball codes, that Scotland could win a World Cup in. It's the sport where I think the success and improvement of the Scotland team has given a vision of that to the Scottish people. "Australia has been renowned as a very big rugby nation. If we are competing against a nation that's won two World Cups and reached the final of the last one, we're not a million miles off. We're not." A fifth-place finish in this season's Six Nations seemed like a stalling of momentum for the national team, the thrilling second-half fightback at Twickenham notwithstanding. The campaign must be viewed in the context of a savage injury list, which tested the depth of Townsend's resources like never before. Wales coach Warren Gatland suggested a lack of quality beneath the surface was exposed for Scotland, but Johnson believes the playing pool has widened in recent years, to the extent the reintroduction of a third pro team to house the emerging talent may have to be considered down the line. "The first selection meeting I had with Andy Robinson ahead of the Australasian tour [in 2012] we struggled to sit down and pick 27 players. Now we've come such a long way with the choice," said Johnson. "At the moment I'd say we probably have two-and-a-half teams ready to go. That's why Glasgow are able to play in the Pro14 with 20 players out, and when you look at the side they can still put out it says a lot about our depth. "We're looking at putting players abroad like what we've done with Nice. We're trialling something with London Scottish. We know there will be a need in the future. Our progression is going to take some time. "In five, six years or whenever it is, we're going to be confronting some scenarios and that may be a third team some day." The opportunity to move back home to Australia was too tempting for Johnson to turn down. "I feel like I owe them something," he says. How he'll be remembered among the Scottish rugby public depends on your perspective. A penchant for wisecracking in news conferences after sore defeats alienated most of the Scottish rugby media, and by extension, a great many fans. How such mis-steps have been offset by the subsequent success delivered by the likes of Cotter, Townsend, Cockerill and Dave Rennie on Johnson's watch, and how much credit the Aussie should receive, is sure to be debated for a while yet. "It was the toughest decision I have ever had to make, I was very conflicted in so many ways," he said. "It's never been about me. I just wanted Scotland to be really good and get respect at the highest level. It hasn't been perfect but I think we have certainly moved that dial a bit. "Getting two teams into the quarter-finals in Europe, it's never happened. Winning a Sevens series, it's never happened. Winning the Pro12, never happened. Beating England at all age groups, never happened before. So it tells you it's a pretty good period for Scottish rugby. "I think we're in a better place and if I've helped that then great. It's not about me, it's about Scotland and if I've made it advance a little bit then I'm proud to be a part of it."